No cutover happened (as of 4:30p Sunday) on neither track at neither end. The new crossover might look a little more complete, but it is hard to see (to my eyes, anyway) what progress they might have made this weekend. It is definitely the case that a first layer of stone ballast has been laid now through the entire length of the project whereas last week there were still patches of graded dirt. The new crossover is still unconnected to anything at either end. The Lowell line tracks are exactly where they have been for the last several weeks. Didn't expect anything to happen. The advisory you posted indicates next weekend and the weekend after (cut down to the relevant dates). On Friday, November 10th ... through the start of service Monday morning, November 13th.... Friday, November 17th through Monday morning November 20th. So let's build clear schedule of what is fair to expect. Truer words were never spoken. Seems that as far as transit goes in Boston, the operating word is "complicated." Last edited by CRail on Mon Nov 06, 2017 9:50 am, edited 1 time in total. and Haverhill lines. The glacial progress on the bridge and the latter mainline are embarrassing. bridges in weeks and we are going on 5 plus years. Track throwing for the new Tufts interlocking will begin tonight. 3702 and 3806 to come back via Reading tonight. The progress on this interlocking is putting CPW WJ to shame. Should be done in no time. 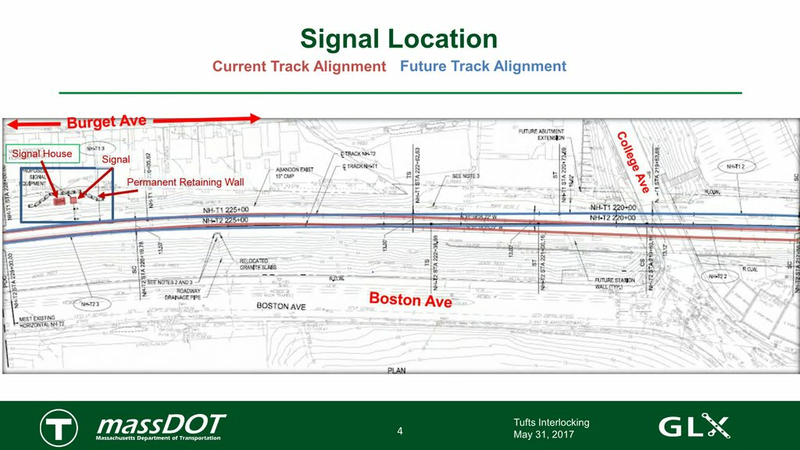 Outbound track appears to be in its new slot: already cut, dragged, and re-connected at both ends of the new crossover. Seems to be awaiting final ballast work. The inbound side appears entirely untouched. engines the T recently acquired. Any idea if they will play it safe and only do the out bound side this weekend saving the inbound for next, or push ahead and try to get both tracks done this weekend at the rate they're going? Doubt if both tracks will be done. No.1 Track for this weekend only as far as I know. As of Monday c.11am, it looked like the outbound Lowell Line had had its ballast fully groomed/tamped, and at the same time, crews were working all along it (I saw a construction vehicle moving something about the size of a single tie). Did they operate from just the inbound track midday Monday? It looks like the brand new retaining wall behind Burget Ave has left an extra alcove for a future CR signal mast and related cabinetry--is this so? Is this something that's part of this project or just left there for the long run? (otherwise there's a big, multi-level signal mast near the Harvard Ave bridge (at the inbound edge of the new crossover) that seems to have enough signals on it to cover all possible movements. The location where you dropped the pin seems to be the exact location where the home signals for Tufts will be for inbound trains. BostonUrbEx wrote: The location where you dropped the pin seems to be the exact location where the home signals for Tufts will be for inbound trains. Last edited by Arlington on Tue Nov 14, 2017 9:43 am, edited 4 times in total.